The upcoming weekend is one of the most action packed club football weekends of the season. 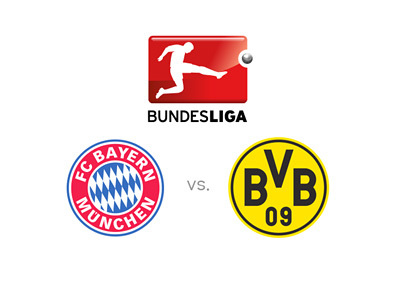 Perhaps the most interesting game is happening at the Allianz Arena in Munich on Sunday, October 4, 2015, when first place Bayern host second place Borussia Dortmund. This match in Germany is called Der Klassiker. After seven games played in the Bundesliga so far this season, Bayern have a perfect record and 21 points to their name, while Dortmund are at 17 points, undefeated, but with two draws in their last two games vs. Hoffenheim and Darmstadt. If Bayern win this match, they would go up by seven points and it would be safe to say that this season's Bundesliga title race is already over. Bayern Munich are a dominant force in German (and European) football in recent years. The odds of them winning their fourth consecutive Bundesliga title this season are a staggering 1/25 at the moment. Pep Guardiola's side have won all the games across all competitions so far this season and the team striker, Robert Lewandowski, has scored 10 goals in the last 3 outings alone. Borussia are the only team that could potentially challenge Bayern domestically this season. Winning on Sunday would be a huge feat and would be celebrated not just in Dortmund, but nation wide. Aside from Bayern fans, the entire country is hoping for a more competitive season. Can Borussia liven up the title race by getting to one point behind Bayern in the standings? Thomas Muller and his teammates are the heavy favourites to win, and if they do, they will get that much closer to breaking the German record of most consecutive league titles. Let's see how things play out at the Allianz Arena. The kick-off is at 5:30pm local time.